Land along the Euphrates and Tigris rivers are home to some of the most ancient human civilizations. The successor of the great past is today the capital of Iraq - Baghdad, which is filled with so many mysterious facts and historical events that only one life would not be enough to understand the greatness of the Persian culture. Baghdad is now only a pale reflection of which has been in the past. Military conflicts in recent history of Iraq also affect a negative outlook of which today is Iraq. Baghdad is the largest city in this Asian country and second largest city in Southwest Asia after Tehran. Located in the central western part of Iraq, Baghdad, lies on the river Tigris. From there the Euphrates river is only around 50 miles away. 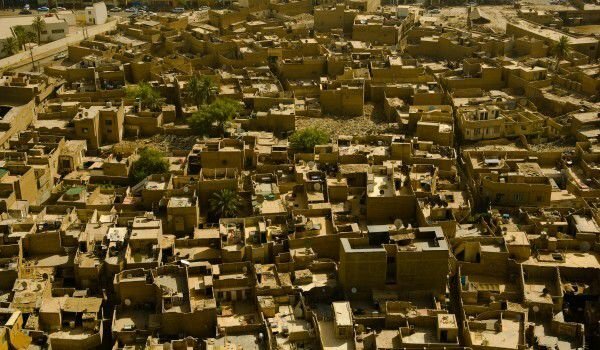 This former medieval capital of the Abbasid caliphate today has a population of about 7.5 million people. The name Baghdad derives from the Persian Bag-dad, which means "God given" or Bag-To-Doo, which in translation means "Garden of God". The story of Baghdad began sometime in the 8th century. According to legend, the second caliph of Iraq, Abu Jafar al Mansur, wanted to build a new city for themselves in places where ever ancient civilizations of Sumer and Babylon developed. With a heavy task to build a city and unprecedented land, the most eminent master took over. The designer offered his master to build a city in the form of a circle (hence the name of today's Baghdad). This geometric shape of the urban plan was to allow subjects of the caliph to all be located equidistant from the ruler's palace. Thus arose Iraq with its round shape and its two main separate parts - royal which is the central part and the shopping districts surrounding the palace area which are located between the wall surrounding the palaces and outside. Medieval Baghdad became the capital of the Abbasid Empire. Somewhere around the 10th century the population of Baghdad had been between one and two million people. Baghdad was an important commercial and strategic crossroads. This crossed the main roads of Syria and Egypt, northern Iraq and Persia. Exotic Indian spices and beautiful fabrics were shipped by sea from China to Iraq. The central market in Baghdad, or in other words, the copper market is constantly teeming with people and goods. Be sure to visit this great commercial center, where you can find different fruits, vegetables, fabrics and local craft products, which in some places will literally turn your eyes. Neighborhoods on the west side of the river in Baghdad are richer than those on the east. Although there are many parks and green spaces in the city, sandstorms often rage. Today the National Library in Baghdad has almost nothing left of the vast treasure that is owned. Thousands of ancient manuscripts at the National Library were destroyed during 2003 when the National History Museum with its priceless collection of artifacts was also robbed in the invasion of coalition forces in the same year. One of the most striking buildings in Baghdad is the palace of the apse (Abbasid Palace). This palace dates back to the 12th or 13th century. Palace of the apse is located in the historic center of Baghdad and is very close to other important historical buildings like the Saray Building and Al-Mustansiriyah School, which also dates from the Middle Ages.